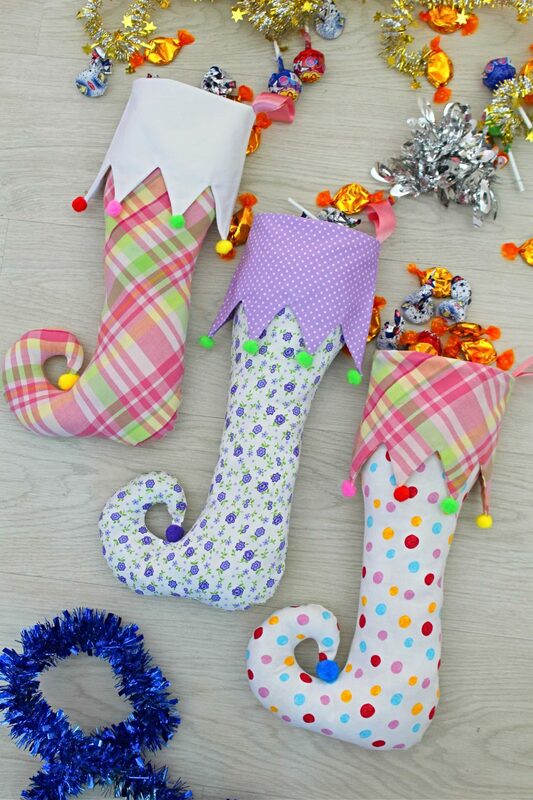 Looking for a fun Christmas stocking pattern idea? 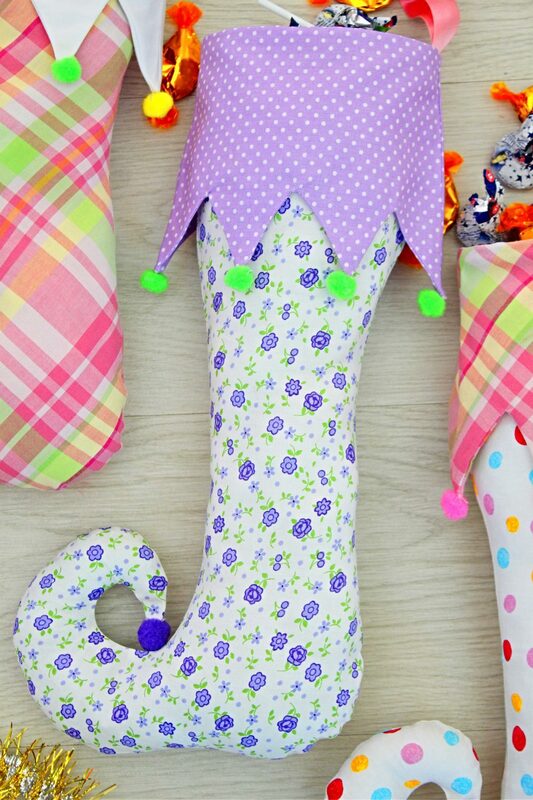 This elf stocking pattern might look fancy and complicated but it’s super easy to make and would make a wonderful addition to your Christmas decor! 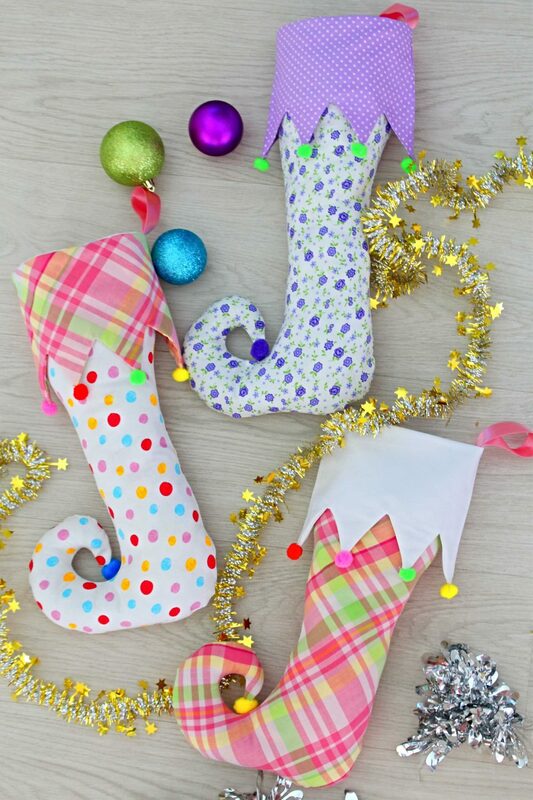 I absolutely love how these elf stockings turned out! 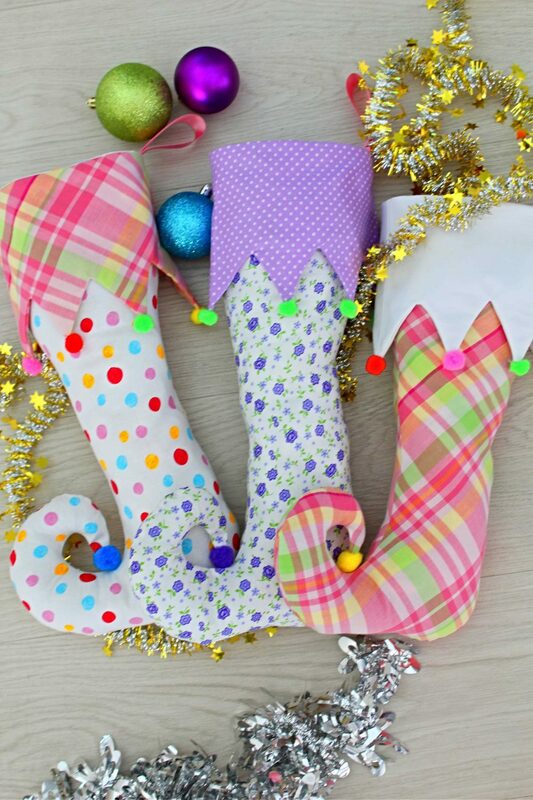 I must admit I was a bit skeptical when I decided to give this project a try but after putting the elf stocking pattern together, sewing these adorable elf Christmas stockings was easy peasy! 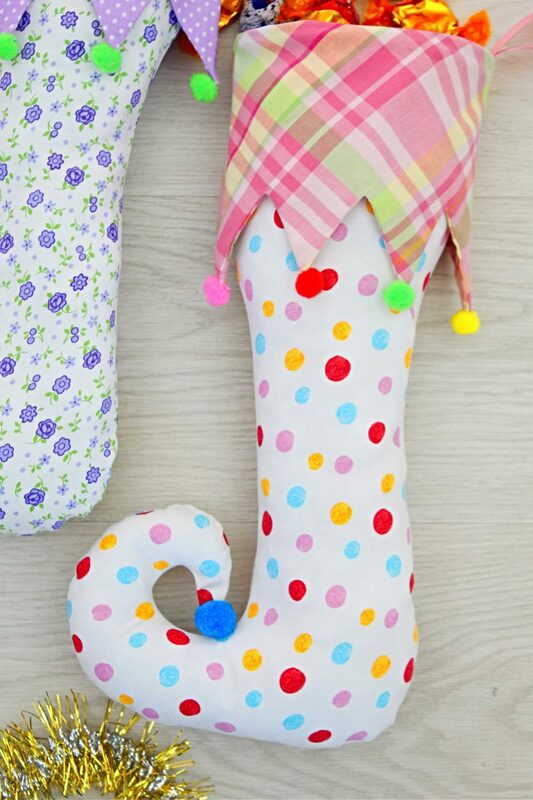 This elf stocking pattern might seem advanced and hard to make but trust me, there’s nothing simpler than sewing these babies! Even those curves and the cute curlicue toe. 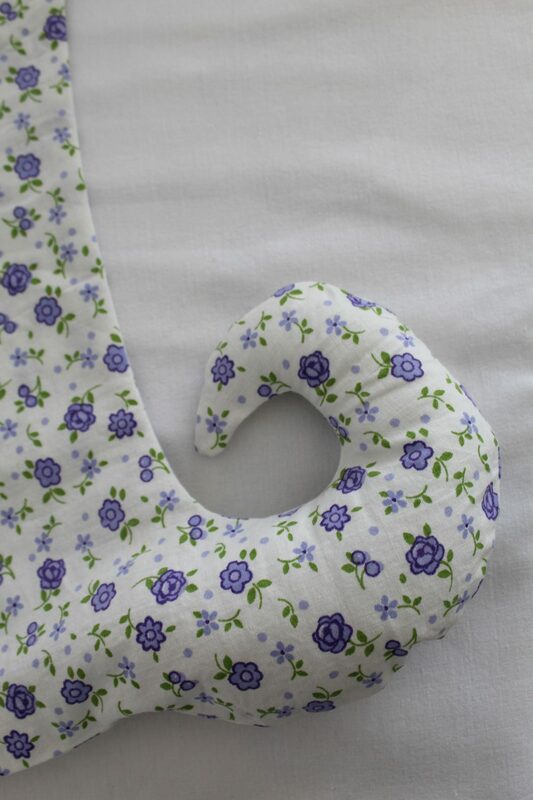 You just need to sew a bit slower than you’re used to, if you’re a beginner. 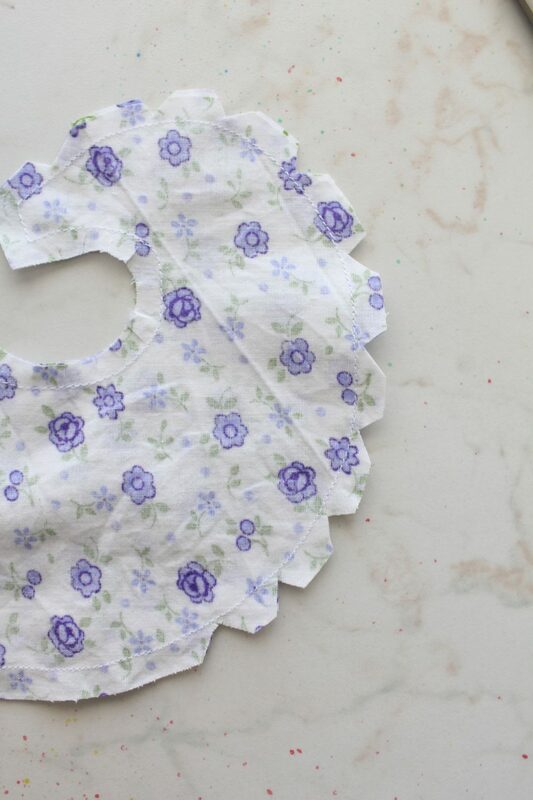 And here’s another “secret” to make this DIY Christmas stocking pattern looking truly professional: press, press, press! 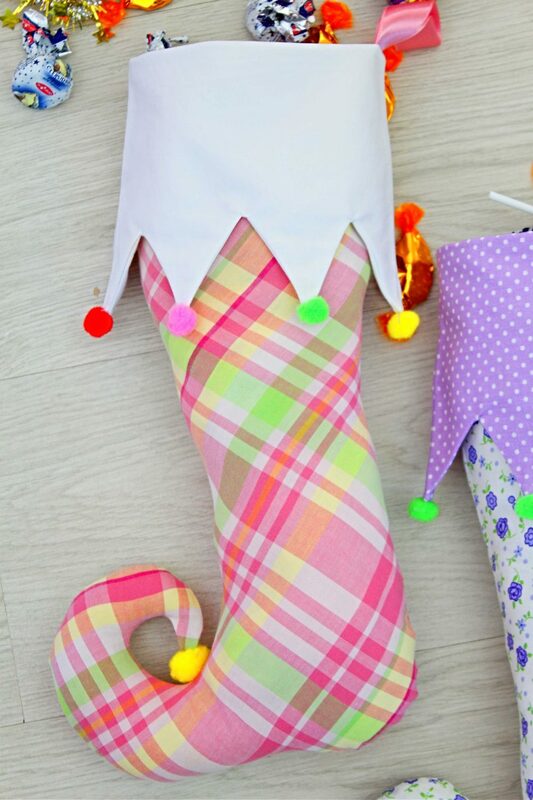 This elf stocking pattern is fun to sew and the stockings are bright and cheerful and will fill your Christmas with smiles! You know I love sweet colors and patterns in my fabric so picking these was a must (lol) Choose the fabric that resonates best with you, your style and the holiday’ spirit in your home. Traditional colors and patterns are always winning options so don’t be afraid to go the classic route. 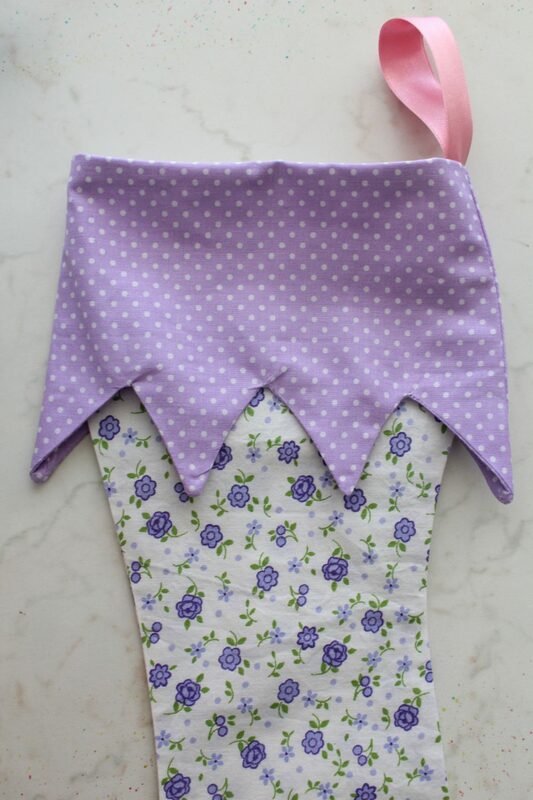 I’ve made my elf Christmas stockings without lining because I designed these with decorative purposes in mind. 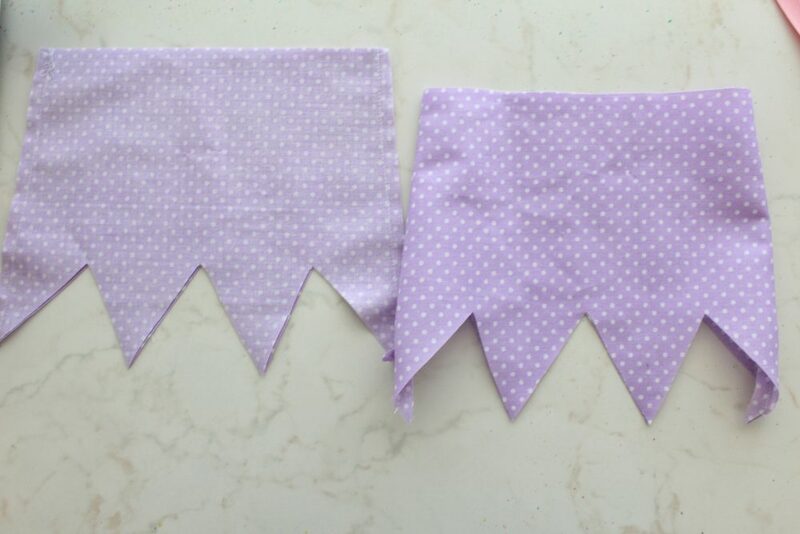 But if you plan on using these for Christmas treats and presents, I suggest adding lining and reinforce the stitching on the hook. I also suggest working with a fabric that allows more control but it’s pretty flexible when working on curves and pointy shapes like the crown. 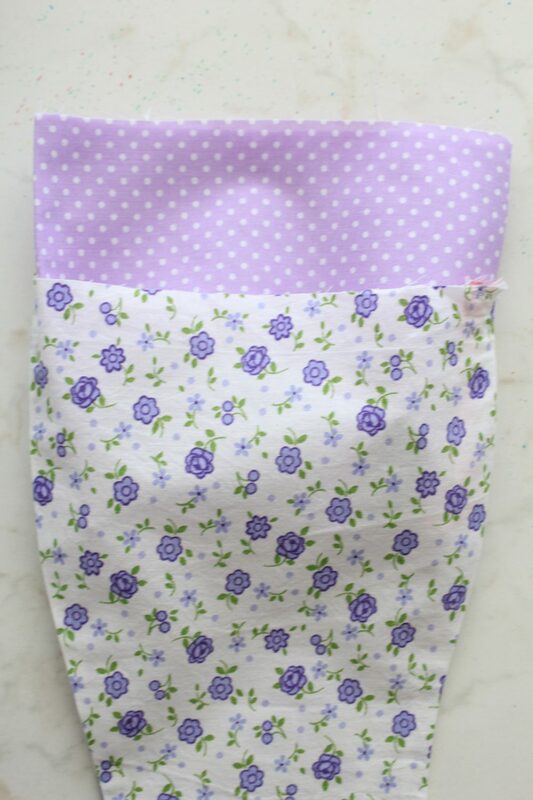 I personally love cotton fabric and that’s what I used for this project. I’ve also decided to decorate my elf stocking pattern only with pom poms but any other decorative details would work (like rick-rack, lace or decorative edge stitch). I personally found the pom poms to add just enough detail and cuteness. Here’s a tutorial to make your own pom poms. My elf stocking pattern makes a stocking of approx. 17″ high. 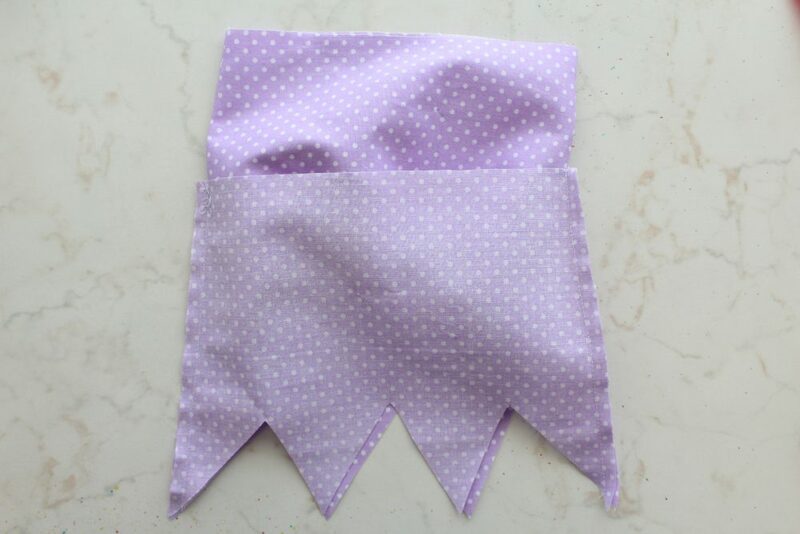 The pattern can be purchased here or get it free when you join my sewing newsletter. 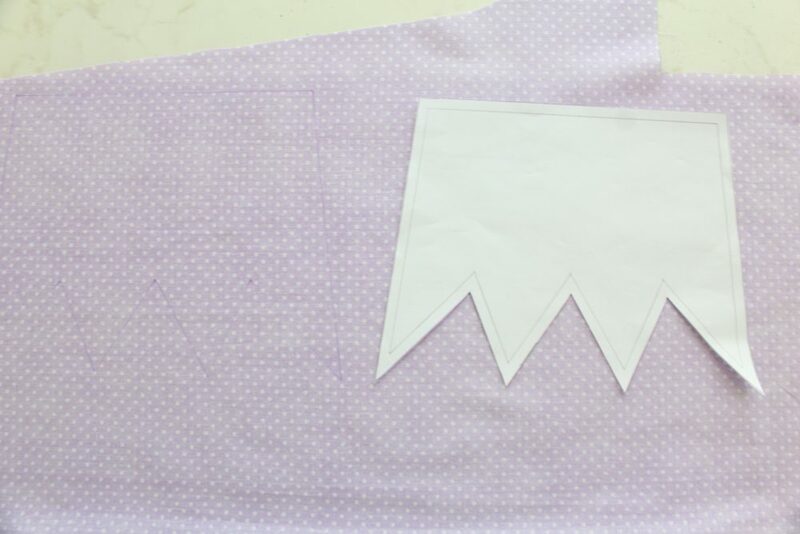 Download the pattern, tape the top and bottom pieces together, overlapping the dotted line and cut. 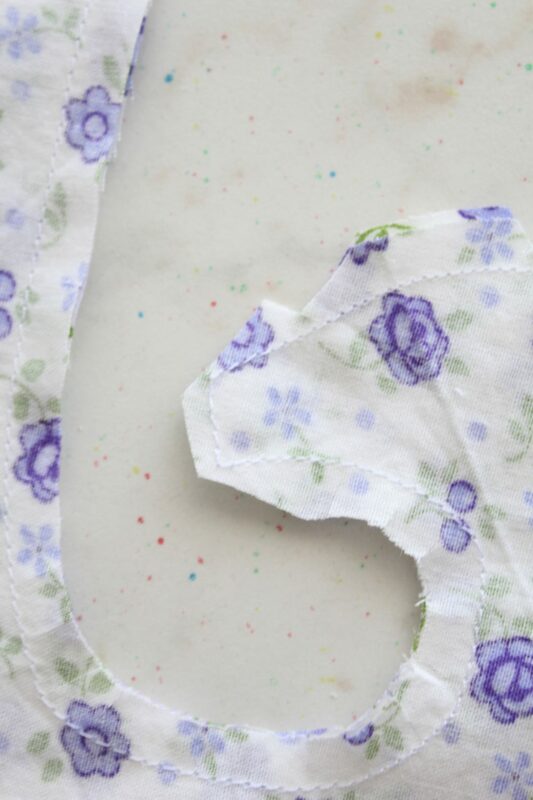 Be advised pattern pieces have 1/4″ allowance included so you’ll sew all pieces using a 1/4″ allowance. 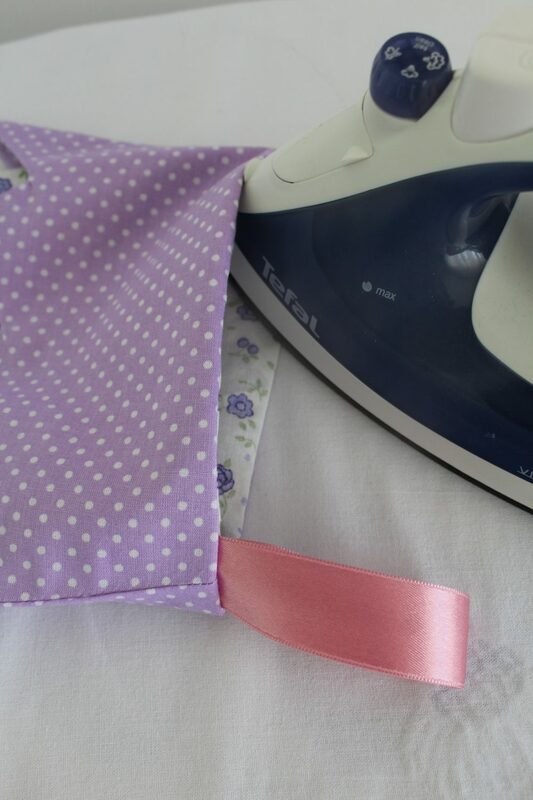 Cut your fabric into two strips and place them right sides together. 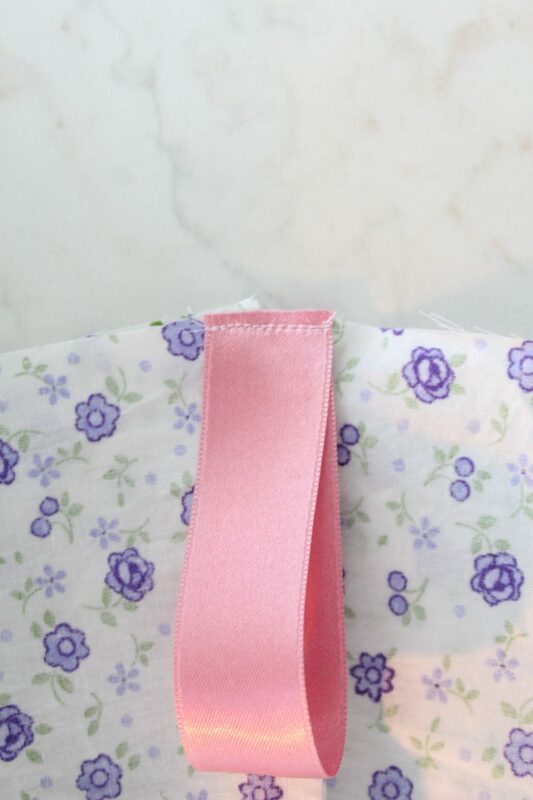 Place the pattern over the fabrics and hold in place with pattern weights. 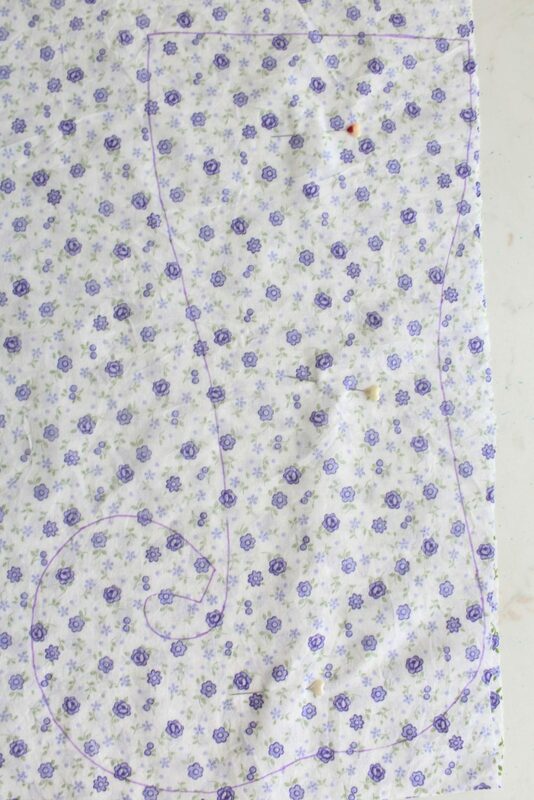 Using your fabric marker, trace the pattern onto the fabric. 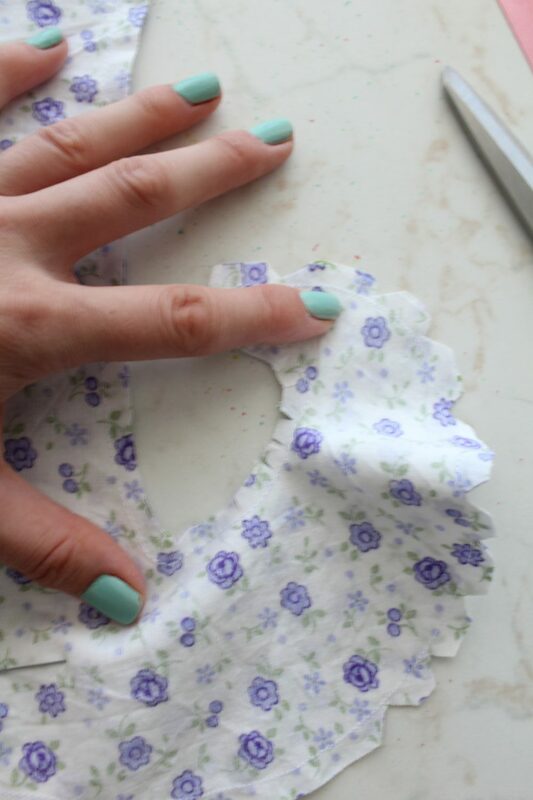 Add pins at the top, bottom and curlicue toe. 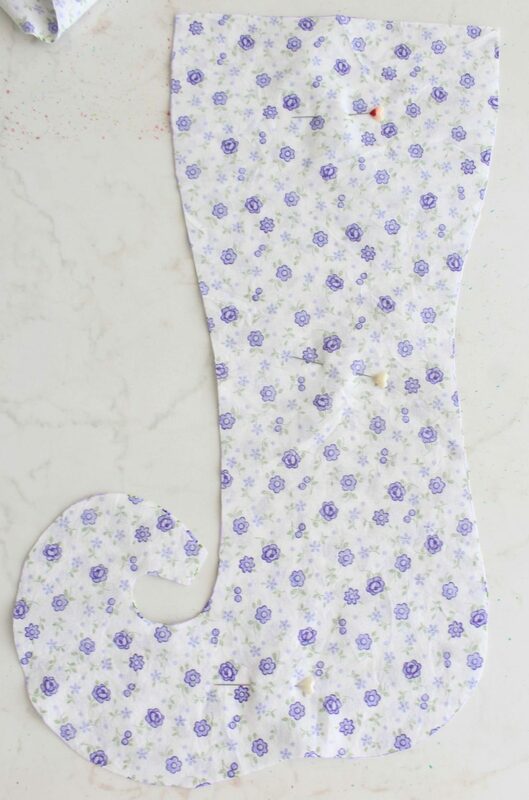 Cut out through both layers of fabric, using fabric scissors. 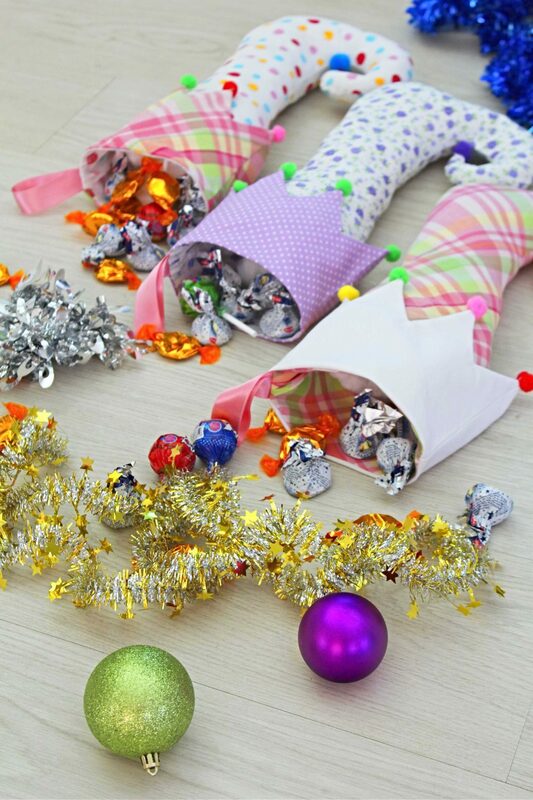 When done, keep the stockings aside without removing the pins. Repeat these steps for the crown. You’ll need to cut 4 pieces for the crown two for the front and two for the back so you have to do the process twice for the crown. 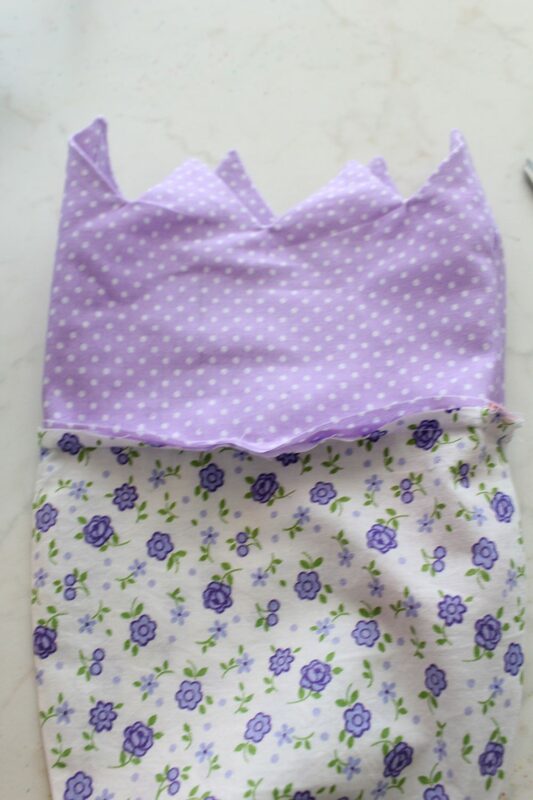 Take the stockings and sew down together around the sides, the bottom and toe, keeping the top open. 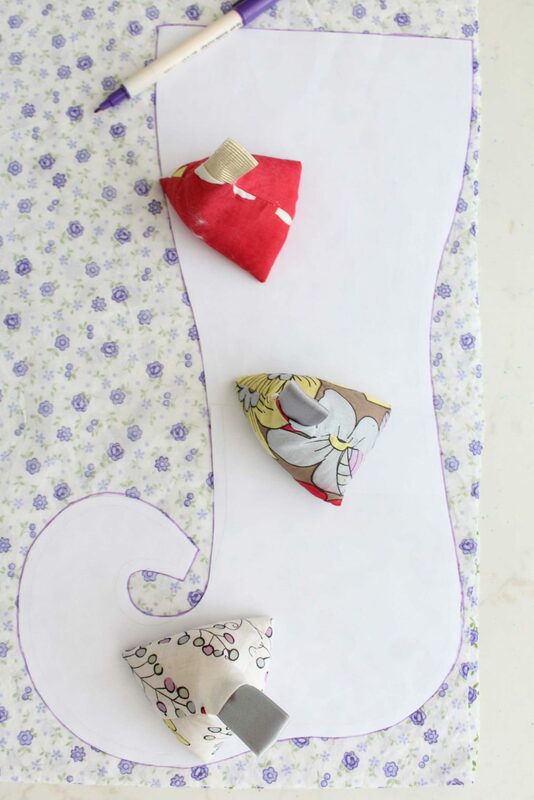 Cut notches out on outside curves, clip the inside curve and clip the seam at the toe. 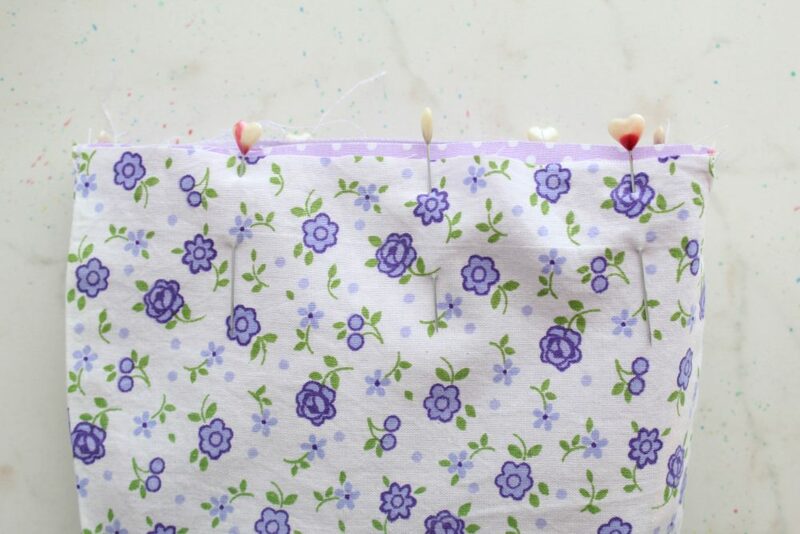 Turn stocking right side out and using a blunt point tool like a pencil or a chopstick, push the toe out until nice and sharp. Fill the toe with polyfill. 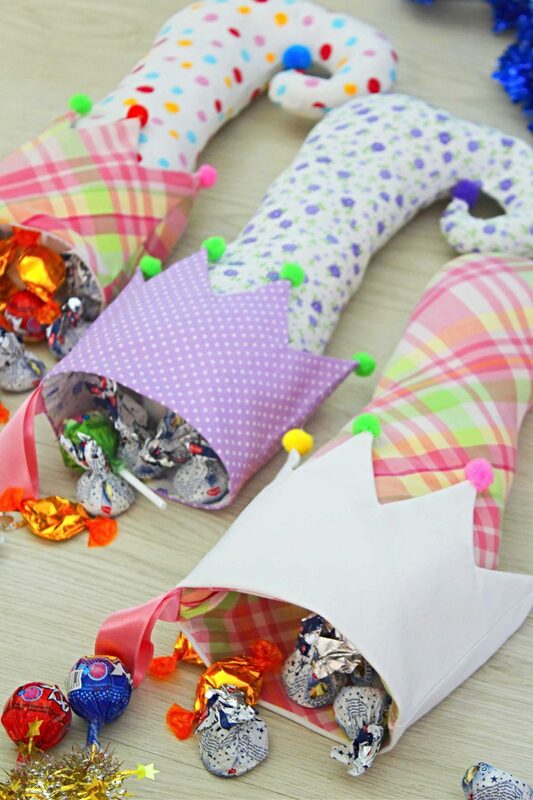 Take the second pair of crowns and sew the sides. Turn right side out. 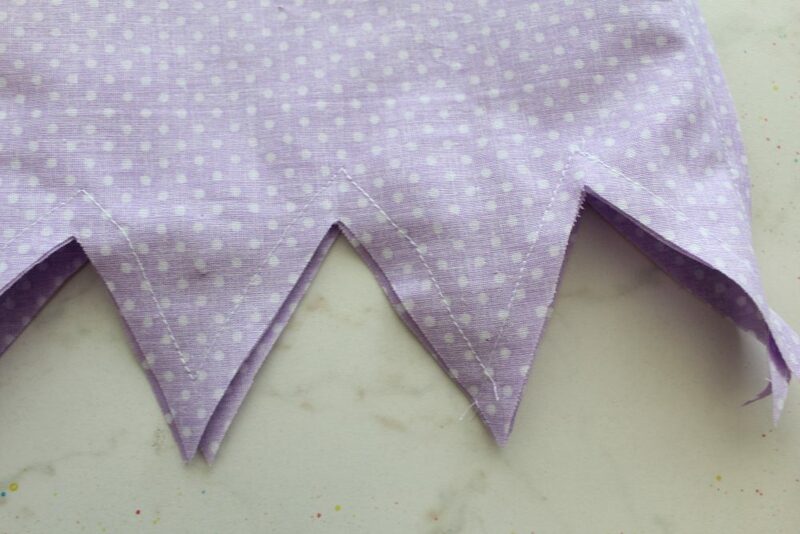 Slip the right sided pair inside the wrong sided pair and match seams and crown points. 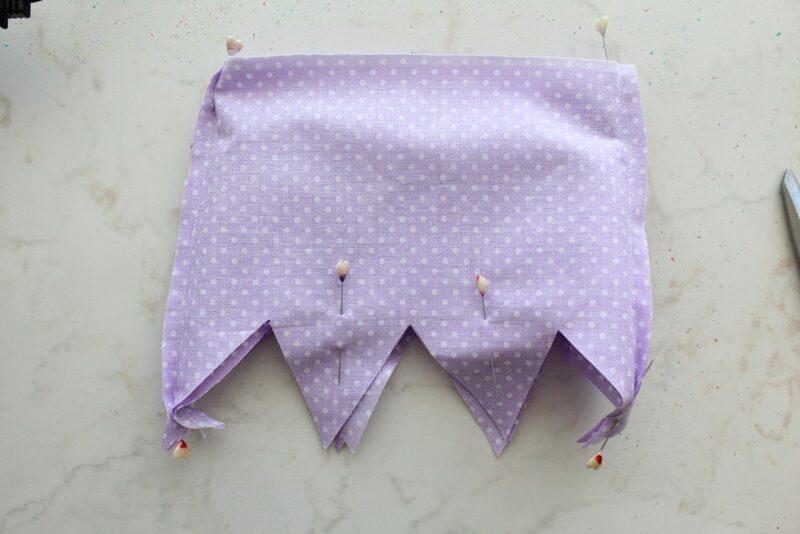 Pin the crowns together then sew the points with a 1/4″ allowance. Clip into the V’s of each point and clip the tip of each point (I’m sorry, I forgot to take complete photos of this step). Using a blunt point tool like a pencil or a chopstick, push the points out until nice and sharp. Completely turn the crown right side out through the opened top. Take the ribbon and cut about 8″ for the hook. 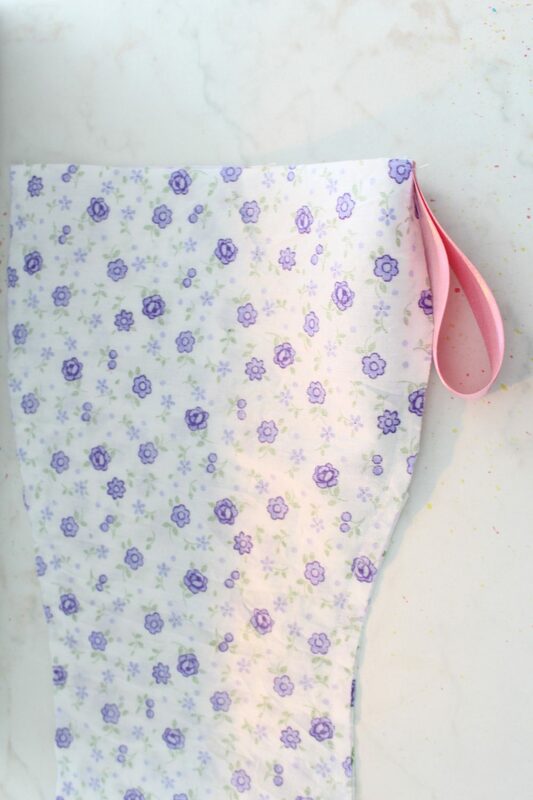 Fold the ribbon in half and pin the raw edges to the inside of the stocking, at the back seam, raw edges up. Edge stitch the ribbon, about 1/8″ from the edge. With both the crown and the stocking right side out, slide the crown inside the stocking, with the points aiming downwards. 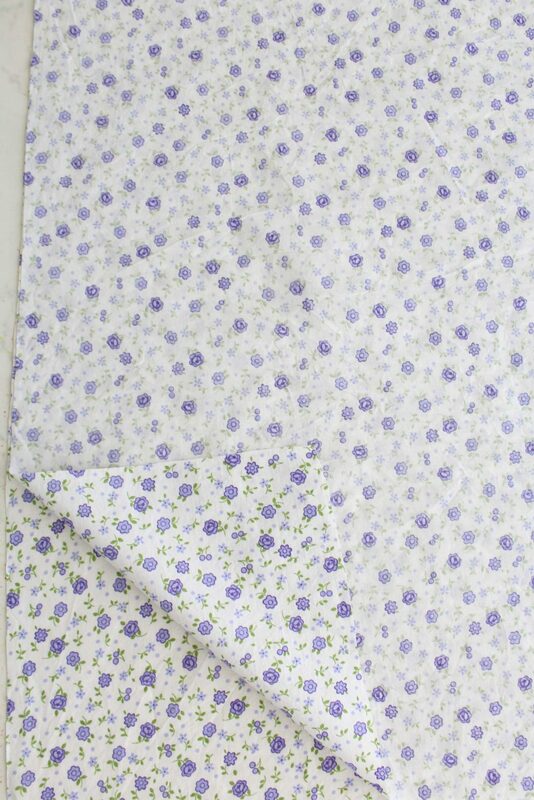 Match the seams and the raw tops, pin and sew with a 1/4″ allowance. 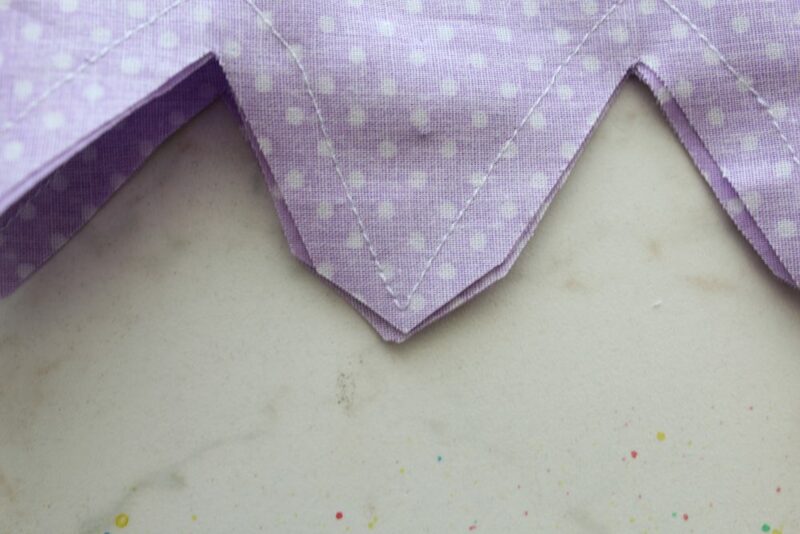 Turn the crown to the outside of the stocking and press the top seam well. 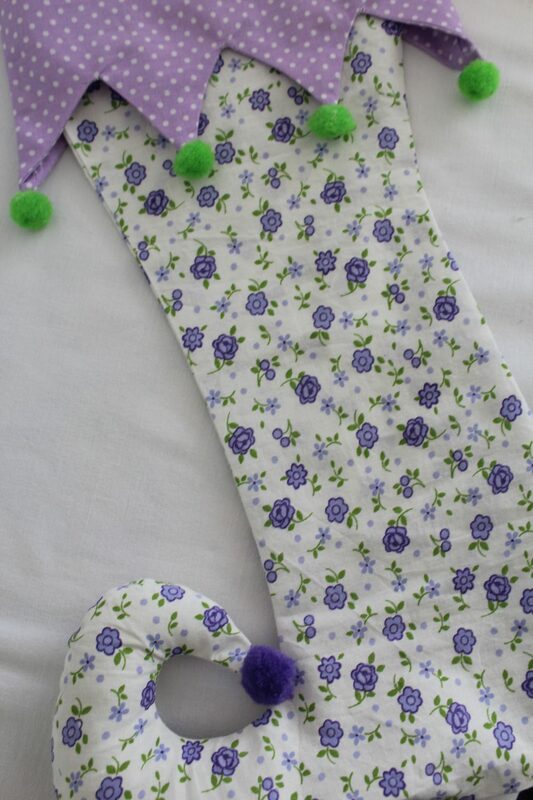 Optional – edge stitch around the top of the stocking for added detail. Hand stitch pom poms to each point of the crown and the curlicue toe.